In the period prior to 1914, an era when painting large works out of doors was in vogue, the art colony at St Ives gained a worldwide reputation as a centre for both the practice and teaching of landscape and marine painting. The initial attraction, in the late 1880s, was the presence of Adrian Stokes, who had caused a stir at London exhibitions, with a new French-influenced approach to landscape painting, based on a careful consideration of tones and colour values. In particular, numerous students from the Herkomer Art School at Bushey, Herts, flocked to the colony, and a number, such as Arnesby Brown, Algernon Talmage, William Titcomb and Arthur Meade, settled in the town. Influenced by Stokes, St Ives artists became known for mood pieces that were intended to evoke poetic thoughts - what the artists referred to as ‘lyrical’ or ‘idealistic’ land- or sea- scapes. The town’s north-facing position, its mild winter climate and the quality of light found there also resulted in it being a popular year-round destination, and the first formal school of painting, devoted almost exclusively to landscape and marine painting out of doors, was set up in 1895. Julius Olsson, Algernon Talmage, Louis Grier and John Noble Barlow were amongst the leading tutors, whilst students came not only from other art schools around the country but also from around the world. The St Ives experience resulted in many of these students becoming the next generation of leading marine painters in their home countries. This exhibition is the first time that this story has been told and the international influence of these Schools of Painting highlighted. Adrian Stokes is represented in the exhibition by three works - The Harbour Bar (Leeds Art Gallery), his depiction of fishing boats going out from the Hayle Estuary over the Hayle Bar into St Ives Bay under a sunset sky, Cows in Copse (also Leeds Art Gallery) and the atmospheric Marazion Marshes, which has been used for the poster image. Arnesby Brown is represented by Nottingham Castle's brilliant little sketch for The Two Piers, Arthur Meade by a depiction of rocks at Clodgy and William Titcomb by Gull Nesting, his vibrant depiction of Hor Point. 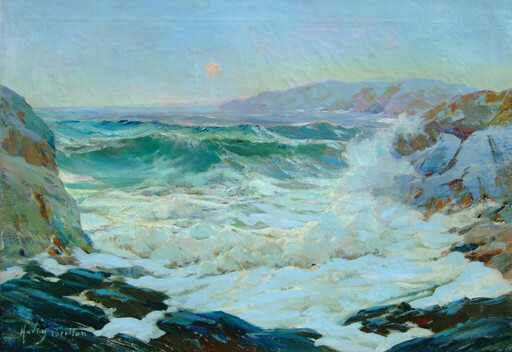 Julius Olsson, as the leading figure in the Art Schools, is also represented by three works - an archetypal moonlit depiction of St Ives Bay, Worcester's own colourful Summer Seas, Newquay and also their vast and magnificent A Song of the Sea, the title of which has been used for the exhibition. Algernon Talmage, Olsson's principal assistant, is represented by a rarely seen seascape from the Potteries Museum, Stoke, Break in the Storm, and a typical cattle picture. Louis Grier and the Americans, Frank Hutton Shill and Henry Bayley Snell, who also ran art schools in the colony for a while, are also included. 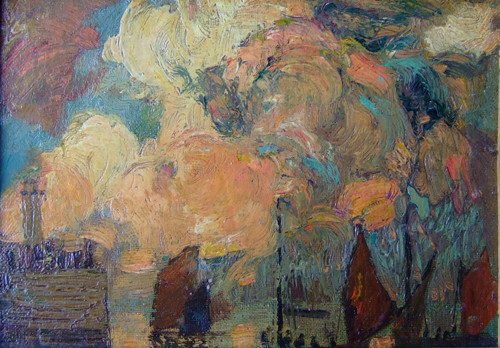 One of the most celebrated of the classes of students is that of 1901-2, which contained the famous Canadian, Emily Carr, and three Australians, Will Ashton, Arthur Burgess and Richard Hayley Lever, and these are all represented in the exhibition, along with sketches, photographs and letters. Further Australians featured are Charles Bryant, who described himself as Olsson's last student, and Franklin White, one of numerous students of Will Ashton who were told that they must not miss the St Ives experience on their European tour itineraries. St Ives also had a major influence on some of the leading American marine and landscape painters and Frederick Judd Waugh, Paul Dougherty, John Carleton Wiggins and George Gardner Symons are further Americans included in the show. Harry Britton, a Canadian artist, very influenced by Olsson, is also featured, as is the Austrian, Rudolph Hellwag. All these foreign artists demonstrate what an extraordinary international community the colony at St Ives was during this period. Amongst British artists included are Terrick Williams, James Hamilton Hay, John Park, Borlase Smart, Louis Sargent, Guy Kortright, William Evans Linton, Charles Simpson, George Bradshaw, Arthur Hayward, Byron Cooper, Beatrice Bright and Agnes Hope Joseph. Borlase Smart's virile handling of paint in Swindon's Ebb Tide on the Reef, with its heavy impasto, is already attracting attention, and this demonstrates the wide range of techniques on show. It is so rare for British art to have an international influence, and yet here is a totally unknown story. Do visit.